The 1930s saw a great shift in Soviet Culture. The nation was moving from a time of internal conflict and struggle that surrounded the Revolutions and Civil War of the 20s, to an era where Soviet Culture began to sculpt a more optimistic identity for the nation. The decade saw the concept of the “ideal” socialist lifted above all others. This idea was all encompassing. If one was to be the ideal or perfect socialist, they would strive to enlighten their minds to the Party’s function; they would work harder and achieve more in the factory; and most importantly they would exercise their body. This transformation of the individual and the importance of physical well-being would help usher in a new era of Soviet Culture that represented a pride and nationalism in country and cause. This shift would usher out the old and bring in the new “ideal” generation. 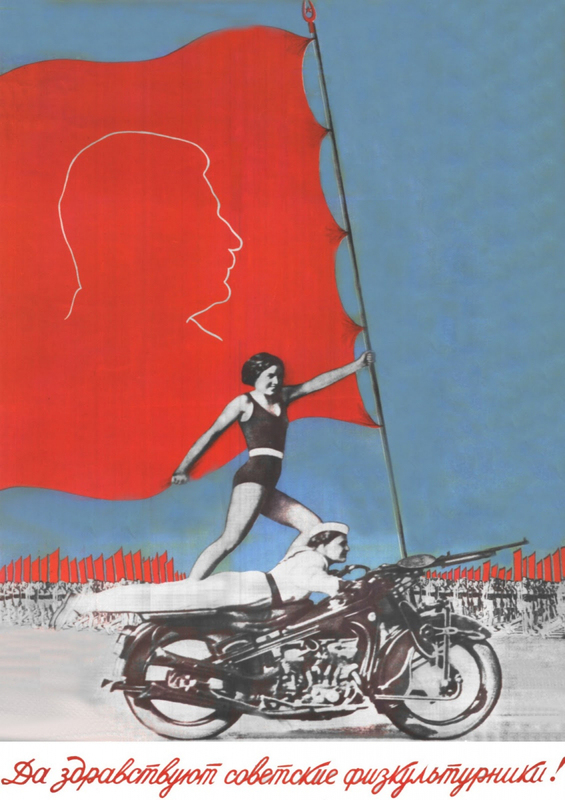 The above image is titled, “Long Live Soviet Physical Culture”. This image encapsulates perfectly the mentality of the Party’s view on the importance of being physically fit. On the image you have a motorcycle front and center acting as a symbol of industry and the Soviet manufacturing prowess. Laying flat on the motorcycle appears to be a soldier or sailor wielding a Russian DP28 machine gun. This acts as a sign of patriotism and yet another nod towards the manufacturing capabilities of the State. Finally, standing tall and proud in the center of the image is a woman. She is standing on the back of the soldier while holding a great red flag emblazoned with Stalin’s portrait. This presents the idea that the importance of physicality is second only to the loyalty to Stalin and the Party. This image acts as a perfect introduction to the mentality that drove Soviet Physical Culture not only during the 1930s, but all the way to the collapse of the USSR in 1991. This can only be what the Party envisioned a “new man” to be. Fit and proud to be a Soviet he proudly carries his nation’s color blazoned with the leader and symbol of the socialist republic, Stalin. behind him are droves of workers and women all fit, all proud, all representing the ideal man. The order and uniformity demonstrates the underlying goal of equality that socialism carries and the attitude of the party to make everyone into an ideal man or women willing to work and sacrifice for the good of the Party. The Soviet Union strove to create “new men” who would play an instrumental role in the further development and advancement of the communist society. As a result, the USSR began to put a strong emphasis on the education of the nation’s children. It was the common view of the Party that education, “was the instrument for the formation of a communist society”. This included not only growing the mind, but the body as well. Starting at a young age, the State derived education system would ingrain in the youth the importance of staying healthy and physically fit. The aim of this education was to create well rounded individual who was both smart and physically fit. This “well rounded” individual would give the Soviet Union its star citizens and more ammunition with which to declare the superiority of the socialist way of life over that of the capitalist West. Much of the West at this time did not have a regimented physical education program in their schools. If they did, it was aimed at producing athletes that would go on to compete on a regional, national or global scale. It was not like the USSR’s that aimed to hold all of its people to the same standard of physical well being. This generally accepted idea of physicality would aid in producing the most fit generation of men and women the Soviet Union, and the world, had seen. 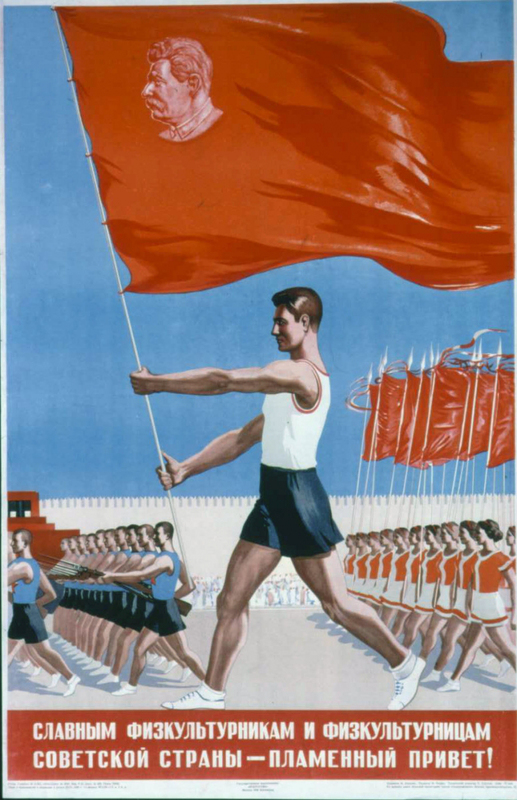 The USSR used this image of a fit citizen as a symbol. The Party believed the physical well-being if the individual was, in part, and physical representation of the person’s intellectual character. In other words, a strong body meant a strong mind. The conclusion can then be made that if these men and women were citizens of the USSR, and were under the influence of communism, then the State lead education and physical programs must be responsible for the creation of these “perfect” men and women. The USSR wanted both men and women to exercise their bodies. This image presents women of all ethnicities and appearance partaking in physical activity on the sunlit sloping hills of the motherland. It presents an optimistic view that is seemingly easily accomplished. 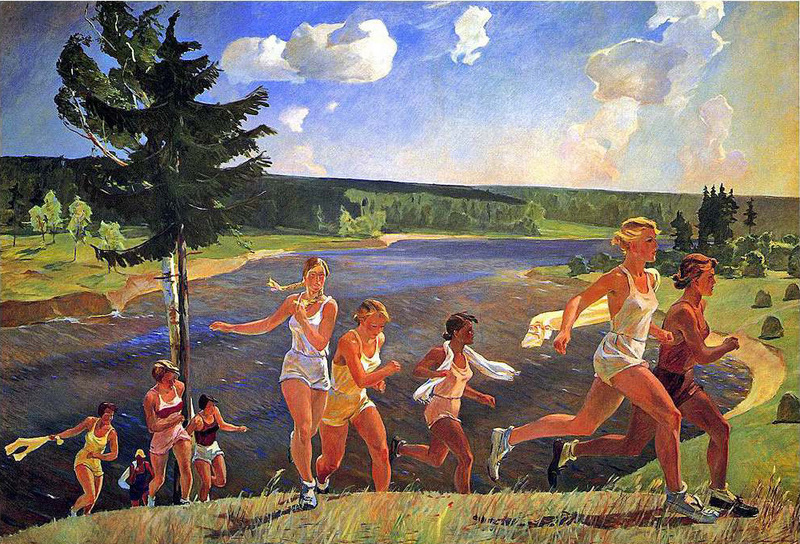 The creation of physical culture within the USSR represented the cultural shift that was taking place during the 1930s. The 1920s saw the newly formed socialist state go through a period that can be equated to something along the lines of an identity crisis. Here was a newly formed socialist nation, the likes of which the world had never truly seen. That goes for the people of this new power as well. The 1920s saw internal struggle to wrestle with the what the new socialist state was and what its place in the world might be. The 1930s, however, ushered in a time where the USSR began to cement its cultural identity. This is evidenced in the stress placed on physical well-being. The physically fit person represented someone of sound mind and spirit willing to dedicate him or herself to the communist cause and better their nation and party by taking pride in their body. mind and work. The healthy individual represented a healthy and prosperous nation. Below are a couple of videos that demonstrate the scope and scale of the Soviet Physical Culture. They help illustrate just how significant of a movement this was and that it really did effect and touch many peoples’ lives. Great post! I like the way that you explain the culture a little bit in the first paragraph and then tie in your primary sources to it. Great job of using videos in your post too; I thought the footage of the physical exercise was very interesting and a cool addition to you blog post. Very well done! Many totalitarian regimes, such as China and Nazi Germany, have long formed groups for teens and young adults to get them physically fit and active within the Party. I did not know that Russia placed such importance on physical education but it does not surprise me. Physically fit people were much more likely to be used as propaganda tools promoting how great the government was and represented the new Soviet culture. Great job! This is really interesting. I personally agree with the connection between the health of the mind and the body. While we typically associate teen fitness programs with totalitarian regimes, the United States actually tried something similar in the 60s under JFK (I linked the video below). It is highly possible this was initiated to better prepare the United States for a war during the Cold War. Although these types of programs are seen as preparations for war I think they could be utilized today in a constructive way to improve the overall health of our nation. A comprehensive fitness and nutrition program for middle and high school would not be a bad thing considering our current obesity rate in the United States. Thanks for posting this video about PE in the US in the 60s. There are some really interesting resonances here. You found some great sources for this post. Not only were the posters great, but the videos gave so many great examples of the new physically fir culture. I always knew the USSR created a well fit persona for the people to strive towards, but I never new when or how this began. It just comes to show how far the USSR went to create this new fit culture. Very nice post. Great use of primary sources, especially the third image. The concentration on female fitness and diversity illustrates the inclusive nature of Soviet physical culture. I really like that you included so many artifacts in your post, and it really backs up what you said well. It really contributes to the whole narrative of the ideal Soviet that they tried to create. I like the point you made that a strong body leads to a strong mind, and I think they had the mindset that physical wellness is the best representation of how well a state provides for its people and how motivated the people are.